Theremin World - Vintage theremins banned in Japan? Tom at Music Thing has been reporting on the Japanese government's recent ban of vintage electronics. 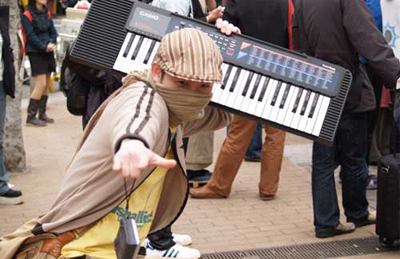 Citizens raised an uproar over the impact of the ban on vintage electronic musical instruments, and so the government has issued a list of "approved" music gear. I've browsed the list, and although manufacturers of vintage theremins are listed (Moog, Maestro, but strangely not RCA), not a single vintage theremin is on the list! Exactly what this means for the theremin market in Japan is yet to be determined. From Tom's excellent reporting, I get the sense that the issue is not completely resolved yet, so I'll keep an eye out on future developments. Any of our Japanese readers want to chime in with more information/perspective?